Reposted from GOVERNING' s blog. Lots of state and local techies are gathering with their federal brethren here in Washington for Government 2.0 Camp, an "unconference" on using technology to make government more accountable and accessible. EPA's Jeffrey Levy, co-chair of the Federal Web Managers Council's social media subgroup, opened the highly unscripted two-day event at the District's Duke Ellington School of the Arts this morning by leading the crowd in a brief chant to set the tone: "Get down, get funky, get loose and groove to the beat." The discussions over the next two days will be moving just as fast. But since this is the kind of event where plenty of people have written their Twitter @names on their "Hello, My Name Is" stickers, the easiest way to follow what's going on is via the "tweets" posted by attendees. You can monitor those short, rapid-fire messages on Twitter using the #gov20camp tag. The organizers also urged the unconference-goers to post relevant information, blog posts and images on the wiki linked up at the top of this entry. Adapted from my "Futurist" column in the March 16 issue of CQ Weekly. Putting limits on some kinds of genetic research has always been a bit like trying to regulate spam. Somehow those unwanted and often-offensive junk e-mail messages continue to invade our inboxes, despite a five-year-old federal law that was supposed to lead to punishment for the most egregious senders. Linking such an irksome inconvenience to the far larger ethical issues raised by research that has the potential to alter the course of human development might seem perilously flippant. But the link is this: If the scientific and technological activities that concern us are occurring mostly overseas, the laws and regulations we impose in our country often have little impact. The problem with spam is that much of it is flung by e-mail servers outside the reach of any authority in this country. Likewise, the genetic research that might be most troublesome to many Americans may take place in labs that are far beyond the bounds of U.S. law. The same is also true of the most promising areas of genetic investigation. President Obama alluded to that in his March 9 announcement overturning President George W. Bush 's 2001 limits on federal funding for human embryonic stem cell research. "Some of our best scientists leave for other countries that will sponsor their work," Obama said. "And those countries may surge ahead of ours in the advances that transform our lives." Balancing the exciting possibilities and frightening consequences of international genetic research is an issue a House Foreign Affairs subcommittee struggled with last summer. California Democrat Brad Sherman, the Terrorism, Nonproliferation and Trade panel's chairman, is best known for his expertise on the spread of nuclear weapons and know-how. But the subject of this hearing was a different sort of arms race: the diplomatic and security implications of the spread of "genetics and other human-modification technologies." In some ways, the testimony from the June 19, 2008, hearing reads more like a Hollywood pitch for a sci-fi thriller than a sober discussion of scientific reality and diplomatic policy -- with talk of biotech's potential for creating supersoldiers, superintelligence and superanimals, as the chairman put it. Witnesses mused about the convergence of nanotech, biotech, computers and cognitive science, with one warning that new applications could "put agents of unprecedented lethal force in the hands of both state and non-state actors." There were discussions of genetic discrimination, eugenics and the civil rights of humans and animals whose intelligence might be enhanced or whose genes might be altered or integrated to the point that definitions become tricky. And witnesses warned of a genetic divide, in which enhancements would go only to the most privileged societies or individuals. Much like his political mentor, the late California Democrat George E. Brown Jr., Sherman came to Congress with a personal interest in scientific matters -- such as research on linking human and computer intelligence -- that were easier for him to pursue when he served on the Science Committee. At the Foreign Affairs hearing, he acknowledged speculation on potential far-off technologies is easily subjected to "mockery" and "cheap derision." But the panel's other members and witnesses seemed to take the issues he raised quite seriously. Many drew comparisons to the rapid development and spread of nuclear weapons -- an analogy that brought the panel to more familiar ground: Could the Nuclear Non-Proliferation Treaty be a template for international agreements to mitigate the potential dangers of genetic manipulation? Jamie F. Metzl, executive vice president of the Asia Society, offered some of the most detailed thinking on what a treaty to curb genetic modification abuses might involve. One key requirement: The accord would need to be "permissive and flexible enough to keep the more scientifically aggressive countries, particularly those with the most to gain from the development of these capabilities, on board." At the same time, Metzl cautioned that any enforcement mechanisms "will be used by opponents of legitimate research to advance principles antithetical to the genetic engineering process as a whole." Creating a workable global framework for regulating fast-moving developments in genetic research will be daunting -- like the driest dry county in the United States trying to ban the sale of alcohol on a passenger jet zipping through its skies, six or seven miles overhead. Ongoing domestic and international disagreements over basic questions, such as whether to allow cloning human embryos for research purposes, point to some of the challenges. As Sherman put it, "We cannot assume that everyone in the world will reach the same philosophical and moral answers that we do, especially when we do not know what answers we might reach." As I mentioned here last month, hundreds of people have registered to attend the previously homeless gathering, and Tuesday afternoon's e-mail announcing the location said a waiting list for the event already has more than 200 people on it. The Governing 2.0 Camp wiki lists about three dozen sponsors -- this blog among them -- that collectively contributed more than $6,000 to help cover any expenses. The wiki also has the beginnings of an agenda that includes introductory sessions on social media tools and an impressive lineup of speakers and presenters, including the likes of John Hale, Web 2.0 guru for the Office of the Director of National Intelligence. As a journalist, I'm not sure I'll have much constructive to contribute. Somebody already appears to have done my idea for a Facebook app that lets you send earmarks to your friends -- and that's probably not the kind of thing this good-government crowd has in mind anyway. 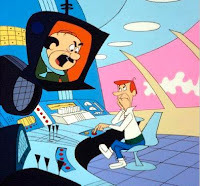 "Even the Jetsons needed someone to push the buttons." -- California employee Rod Breitmaier, responding to Cosmo G. Spacely-like suggestions by two leading candidates for governor there that technology can help significantly reduce the state's public workforce. Breitmaier, a 13-year employee at the California motor vehicle department, made his comment in a story by Sacramento Bee's "State Worker" blogger Jon Ortiz. The comment also was picked up in GOVERING.com's daily "Who Said That?" feature. Hope Breitmaier isn't too worried. There's always work to be done at Spacely Space Sprockets Inc., once ranked the 25th largest fictional company by Forbes. Jon Stewart: "Why is Congress and the media jumping on this?" Samantha Bee: "OK, because we're rotting corpses grabbing for any glimmer of relevance, Jon, hoping at some point one of these retarded things will be the vine that can rescue us from this quicksand. And don't think you're immune, Cable Boy." The Daily Show's recent poke at the current Twitter fixation among media types and government officials is good for some self-aware laughs. My GOVERNING co-worker Ellen Perlman also looked at how some state and local officials are using -- and sometimes misusing -- the mini-messaging service in her latest biweekly Technology e-letter. One of Ellen's peeves: screen-wasting personal musings by people who take Twitter's defining question -- "What are you doing?" -- a little too literally. "If someone feels the need to wake up and smell the coffee, then tell the world he just smelled the coffee, narcissism is at play," she writes. "[M]any users, including government officials and a growing number of government agencies, have twisted Twitter's mission in positive ways. Instead of telling the world that they just dusted the credenza, they're using Twitter--along with Facebook, YouTube, LinkedIn and other consumer-oriented 'social media' channels--to publish information for constituents or colleagues. In return, these officials receive a flow of feedback, links and ideas that can lead to improved service or teach them something they might not have learned another way. Sometimes that input comes from the general public, and sometimes it comes from co-workers or peers across the country, depending on who decides to 'follow' (or subscribe to) your feed and whose feeds you choose to follow back." As Minneapolis Mayor R.T. Rybak tells Ellen, "I love that with a few clicks on a keyboard, I can communicate with a lot of people and hear back instantly.... It's a lot faster than door knocking. It's the most efficient way to get to the most people directly that I know of. And I kind of have fun doing it."